Come hear the intricate and sultry instrumental melodies of classic choro, the edgy syncopation of modern choro, emotive samba and bossa nova, and other genres. This is a rare opportunity to hear a wide range of composers, performed by three diverse acts: mandolin/guitar duo, piano/guitar duo, and quartet of mandolin, 7 string guitar, pandeiro, cavaquinho. 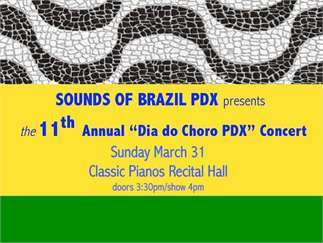 Special guests include native Brazilians Alexandra Santos (vocals) and Gabriela Gimenes fFlute).